Pretty! And colours are great! I made one of these elephants last week - I'm new to knitting with DPN's and I found the pattern to be very easy. @LADYLJP ~ wish there was one! @Lisa ~ lol... I know nothing of knitting, what are DPN's? 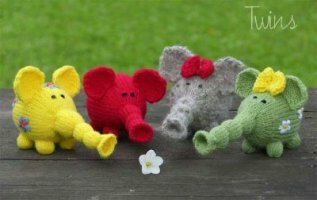 I have only done very basic knitting- but I would love to give these gorgeous little elephants a try- so can somebody please tell me what M1- make 1 stitch means? awesome! they are sooooo cute !! Debbie...M1 means to make 1 stitch and you can do this by knitting a stitch but don't slide it onto the right needle. Instead bring the tip of your right needle downward on the backside of the stitch still on your left needle, wrap the yarn around the right needle as you would for a regular knitted stitch then back your right needle out and let that newly made stitch slide onto the right needle. 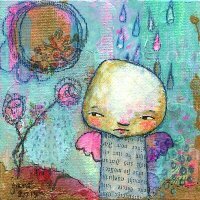 If you're stuck go to www.knittinghelp.com it's a great site for help. thank you for your help, anonymous!